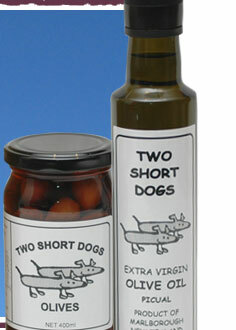 Two Short Dogs is the brand name of olives and olive oil produced by Mark Hadfield and Vicky Webb. The name arose because we have “two short dogs”! Miniature long haired daschunds to be exact. The original instigators of the name were Oscar & Elton. Time has moved on and they have now been replaced by Lucy & Finn. Tremendous enthusiasm about the olive block and the entertainment provided by an abundant supply of rabbits has been a common theme for all the daschunds! The Two Short Dogs grove is situated in Marlborough, New Zealand, better known as the home of New Zealand's award winning Sauvignon Blanc wines. The climate is warm in summer and cool in winter and usually sunny. This climate in combination with 'young' high mineral soil and clean environment produces oils with distinctive fresh herbaceous characters, high in nutritious oleic acid. Marlborough's olive oil is matching its sauvignon blanc counterpart on the international awards circuit. Several oils from the region have won the high international awards at the prestigious LA County Wine and Oil Fair. In 2004 a blend, that included our oil, won a silver medal at the LA County Wine and Oil Fair against 200 entries from around the World, including from Italy, Spain, Greece, France and other top olive oil producing countries.